Premier industrial paint supplies are the leading specialists of a wide range of paint products in any colour you require. Our team have a wealth of experience in helping you find the exact colour match whether its to paint your warehouse in your specific corporate colours or to exactly match the respraying of any vehicle. The list of possible applications for your products is just like the availability of colour - Endless! We can help you match any colour and produce the appropriate paint for any surface. All you need to do is choose your paint colour in the top left of the page or call us on 0115 963 1451 and we will help you find the correct match. Once your colour has been chosen, We can then choose the required paint suitable for your project. We can also make coloured primers to the exact colour of your top coat. 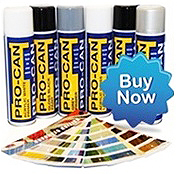 We can also advise you on suitable primers for adhesion. We supply any colour in any quantity for the industrial use. We can carry out industrial paint mixing. We provide speedy delivery service on all of our orders. Click Here to view our shipping rates and shipping information.